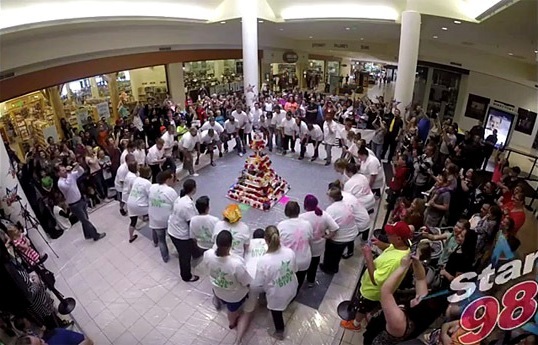 Imagine 40 people simultaneously diving into a 5 foot 10 inch tall wedding cake! Like the proverbial needle in haystack, 40 wildly enthusiastic contestants simultaneously dove into a 6-foot-tall, 800-pound wedding cake last week looking for a valuable hidden gem. A $2,000 diamond engagement ring to be exact! The 2nd Annual Diamond Dive was sponsored by local radio station Star 98 in conjunction with a local baker, who designed the cake, and a local jeweler, who provided the diamond ring.